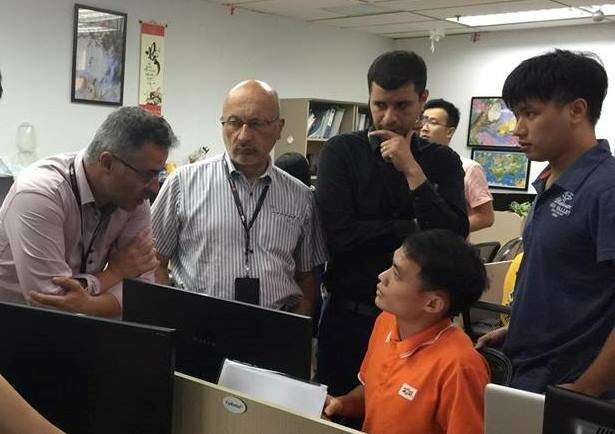 Foreign partners are pictured at a Vietnamese cybersecurity company. Internet security firms are cashing in on the increasing number of cyberattacks targeting entities in Vietnam. But all that glitters is not gold, experts have warned. In 2015, 31,585 cybertattacks were recorded in Vietnam, causing total damages estimated at VND8.7 trillion (US$383.26 million). In the first three months of this year, 7,700 attacks targeted Vietnamese websites while the infamous ransomware WannaCry hit 1,900 computers in the country. According to experts, 52 percent of computers in Vietnam remain vulnerable to viruses and malware. However, of all the cybersecurity companies in Vietnam trying to cash in by offering consumers protection from these attacks, only seven are actually licensed businesses while the rest are unlicensed operations focused on “scaring customers into using their services,” according to experts. Some of the well-known internet security firms in Vietnam are Hanoi-based Bkav, FPT, state-run VNPT, and Russia’s Kaspersky Lab. On top of its popular antivirus software, Bkav now offers such cybersecurity services as firewalls or anti-APT solutions. APT, or advanced persistent threat, is a network attack in which an unauthorized person gains access to a network and stays undetected for a long period of time. The intention of an APT attack is to steal data rather than cause damage to the network or organization. “Kaspersky used to be known only as a supplier of security software to end-users, but since 2015, we have offered in-depth cybersecurity services as well as security training and consultation,” Vo Duong Tu Diem, a representative of the Russian firm in Vietnam, said. Besides these big names are startups that have gained fame from winning security competitions, such as CyRadar. However, according to Dr. Vo Van Khang, deputy chairman of the southern chapter of the Vietnam Information Security Association, there are certain low-quality companies out there that are ripping off customers with lies about their services. Customers, especially companies, are also concerned that some cybersecurity firms are willing to accept money from firms in exchange for launching attacks against their rivals. “Some cybersecurity firms also attack a company with malware or viruses and then offer to help with their services,” Khang said. “So there are many incapable personnel in the cybersecurity market who cheat customers for money despite their poor knowledge,” he added.